I’m still enamored with the idea of signature wrapping. My ribbon, tape, and do-dad supply, however, is woefully inadequate. I had nasty a cold the week of my niece’s 3rd birthday party, so I didn’t have time to replenish my stock before then (the party was on a Wednesday). I had enough cream tulle to make what I call butterfly bows and, of course, plenty rosemary in the front yard to tuck in the bow and supply all of the Greek restaurants in Astoria, New York for the next two decades. To be honest, I suspect I’m the only one who likes my signature wrapping. I think it’s a bit too “of the earth” for most of my family. The reception at my niece’s birthday party didn’t go any better, meaning the other moms remained silent upon beholding its splendor. The rest of the presents my niece unwrapped had bright colors, curly bows, and kiddie paper. Nicholas and I were the only family members in the bunch, and I think I may have come off looking like the austere aunt who spends her time reading literature while her sourdough bread rises. Oh well, I still like it, and it came in handy knowing I didn’t have to make a last minute shopping trip while sick. I’m going to stick with it, though I do plan on buying more stamps, pretty ribbons, cute treats to tuck among the bows, and some fun fabric or washi tape. I’m going to blow my savings at Tinted Mint, is what I’m saying. 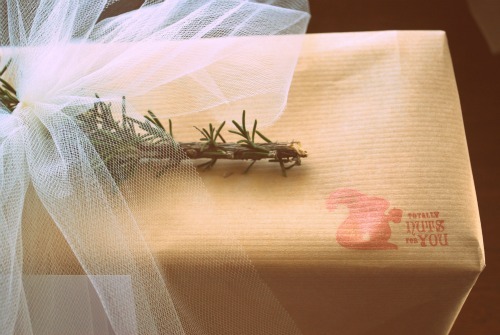 Packing paper is my preferred gift wrap and I love the tulle with the rosemary that you added. You definitely wouldn’t receive a single funny look in this household. The Tinted Mint is quite a find – love the washi tapes! I can understand how it may have fell flat in the kiddie world – they truly do not appreciate the effort or the art. It is beautiful, though. And love the stamp … and Tinted Mint! I love it. But I’m not a kid. Cora definitely prefers the colorful “kid paper” with lots of bows and whatever. I let her choose for presents for her friends & save my favorites for adults. I think your package is divine. 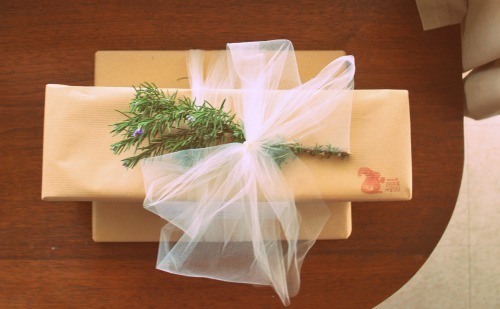 My signature wrapping is cream craft paper and twine. At Christmas I got green paint samples from Home Depot, cut out Christmas trees and attached them for tags. I like “of the earth” wrapping and the simplicity of it. Your idea of the stamps is a great one. I might have to add that to mine. By the way, I’m beyond jealous of your Rosemary supply. I had two huge bushes this summer on my deck. I brought them inside when it started getting cold and they died. I’m still in mourning over them. It hurts my heart to think about it. I tried everything to save them, but nothing worked. 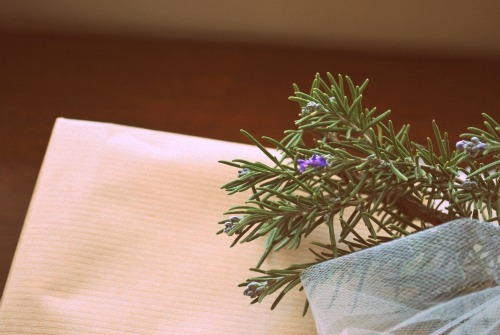 It also hurts my heart that I paid three bucks for two stems of Rosemary this weekend at the grocery store. I completely understand. I think handmade is just not accepted in some circles (their loss). The kids like it when I let them “decorate” the paper with crayons and stickers. My MIL thought it was odd at Christmas but the kids were so proud that they helped with the presents and our niece and nephew did not mind at all. Keep doing it. I like different. And rosemary smells so heavenly. They, as my mother would say, are just jealous. I can smell that rosemary goodness from here. I’m a big fan of your wrapping! I use plain white gift wrap for everything. I add a beautiful ribbon, tag or cards, and sometimes an embellishment (at Christmas, a handmade ornament). On occasion, I’ll add a band of paper printed with my designs. In addition to being “signature” wrapping, it’s a great step in simplifying. I always have appropriate gift wrap on hand. I don’t end up with odds and end of rolls of “themey” wrap that I’ll never use again, which I end up throwing out (wasteful). I like your wrapping style! I’ve used brown kraft paper for a while now and everybody in my family instantly knows which gift is from me. But for the kiddos, I’ve gotten into the habit of buying stickers to make it a little more kid friendly. Well, at my nephews 3rd birthday party, my plan backfired. Knowing that he’d get a bunch of toys, I opted to buy clothing and decided to decorate the gift with Thomas the Train stickers. My nephew wanted to open my gift first, giddy with anticipation seeing the Thomas the Train package and ripped into it and his face fell when he saw clothes. I don’t know if I’ve ever seen such disappointment on someones face before. Thankfully for a three year old it’s quickly forgotten as soon as he’s presented with another gift. If you gave me a gift wrapped like that, I probably would cry. FROM HAPPINESS. I almost wrote that the stamp was in your honor, but I thought that might sound slightly stalker. ;) I think of you every time I use it! 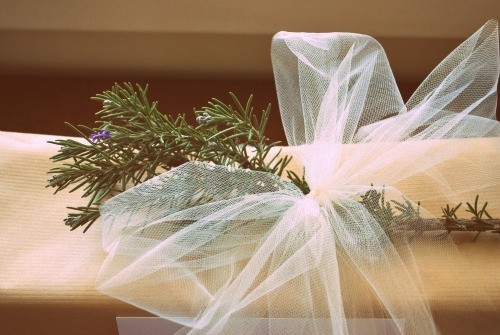 Your wrapping is beautiful and simple. I love your rosemary idea. I started using kraft paper, stamps, and jute a few years ago but I have a bundle of mismatched leftover wrapping paper that I have told myself I must use before I buy more supplies. I’m also a gift bag re-user so it hinders the evolution of my own signature wrapping. My future self wraps beautiful and simply wrapped gifts but my present self is too frugal (cheap) and eco-friendly (lazy). If our odd stash of wrapping paper isn’t the right size or if we don’t have a bag to re-use, I use newspaper. Sunday funnies, from the in-laws (again, b/c I am too cheap to get a Sunday paper), work great for wrapping kid presents. Now, my mom, she is extreme or extremely tacky. She uses cracker and soap boxes to wrap gifts. The kids love it though. And, I’ve been meaning to ask you if you are using your sour dough starter. I need to pick your brain about how you started it! Have a great Monday! I need to go! I’ll email you and we can talk dates. i agree with an above post that letting the kids decorate your signature wrapping might be fun for kid presents. i almost always let my oldest (3 1/2) decorate something if it’s a present from a friend. i always have him make his friends birthday cards and his little friends seem to be very happy to get the homemade cards. i probably won’t win any “prettiest card” prizes from the other moms, but whatever. um, and i have spent more time than i’m willing to admit thinking about my signature wrapping. :) oh and i LOVE that stamp! I love the bow, I want to find out how to do the ‘butterfly bow’! And I especially love how you made me laugh with your recall of the moment at the part…..make-up, lights, curtain, all attention on the wrapping and kerplop! A tough audience. Funny! As a non-American who recently lived 5 years in NY, I noted that all American women have been taught from birth how to wrap. I was very impressed at the gift-bag and tissue techniques. Each one I asked gave me a different procedure and i wondered if really it was genetic and I would never get it. Here in New Zealand, tying a skinny bow round is going all out! The other moms clearly don’t read enough blogs! Ha. I’m admiring from afar. I really like your idea of including a sprig of something natural on top. I’ve been waiting to use up all the wrapping paper I already have and transition to wrapping with some kind of recycled craft paper, and use baker’s twine or yarn instead of tape and ribbon. That’s too bad the rest of the family couldn’t appreciate your wrapping. I’d love to get something wrapped like that! My niece and nephew love getting any ole present and tearing open the paper. I really like your signature wrapping. I had signature wrapping paper too for about a year (okay, so it wasn’t so much signature wrapping as a-hugely-abundant-supply-of-the-same-paper-I-bought-on-sale-that-didn’t-have-a-specific-theme-so-worked-for-all-occasions wrap) and it made gift wrapping so much easier! But your wrap is kind of like an oasis in a desert of plastic curly ribbon and neon. I am a fan of your signature wrapping!! Don’t be swayed by the silence of the other moms….maybe they were just jealous of your crafty, rosemary-wielding skills! I actually found velvet ribbon at Christmas and totally copied your signature to wrap my sister’s present. And her jaw did drop at the beauty of the wrapping job. And she did comment on its loveliness. Thanks to you, she now thinks I too have creative powers. Love this idea! It looks great! 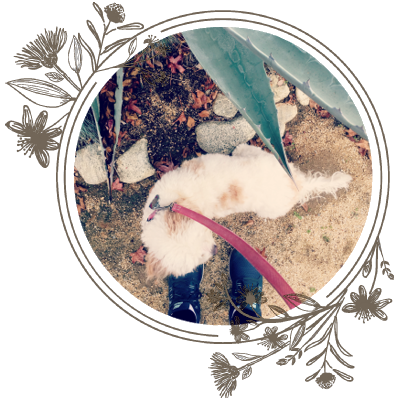 i went this way for the holidays & thought that all my gifts looked so wonderful together. butchers paper, twin, some ribbon here & there. so simple, so sheek. *cue silence & looks from others* oh well! My signature wrapping for, oh, the last 15 years or so, has been kraft paper. Once in a blue moon, I will wrap something in plain white. I do use some kraft-colored take-out boxes and gable boxes I use too. All with some type of grograin ribbon, generally green, cream, or black. Use it for Christmas, birthdays (kids or adult), weddings, babies. It’s all the same. The other moms were just jealous they couldn’t make something like that. I love it.